Still thinking about hoods. Then, yesterday, came across this beautiful cover photograph by Clifford Coffin for Vogue's April 1951 issue. 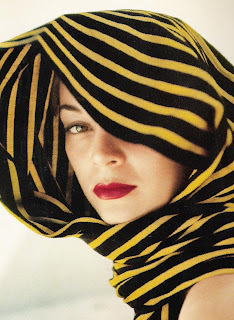 According to the caption, model Jean Patchett'a headwrap is a Mexican rebozo, a term I'd never encountered before. What fascinating garments these are. Essentially, they are the living fabric of Mexico, rectangular shawls that were traditionally handloomed, initially from maguey cactus fibers, later from cotton, wool, or silk. They were worn to lend warmth, modesty, and/or the ability to carry babies and other cargo hands-free, and then, with the Spanish conquest and sweep of Catholicism, they became mandatory head-coverings upon entering church. Today, according to this in-depth article by Vicky Cowal in The Herald Mexico, rebozos are still universally worn in Mexico across class and regional culture. Frida Kahlo, below, was rarely without one. 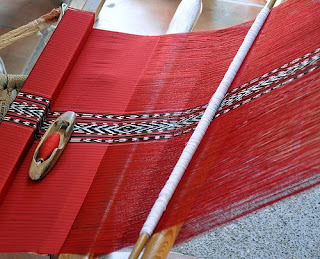 What sets rebozos apart from other varieties of shawl--from pashminas to paisleys to Cantonese--is the distinctive patterns that may be knotted into the fringe, macrame-style. Also, tells Cowal, traditionally-dyed black rebozos--often used as shrouds--are known as "rebozos de aroma," as the black dye has an unpleasant smell which is subsequently masked by soaking in rose petals, orange leaves, and fragrant herbs, whose scent may linger for years. Authentic rebozos are still found across Mexico, and are ubiquitous in markets around the country. ¡Viva rebozos! Long may their tradition continue. Ah yes, writing that explores fashion beyond the facade. As an art historian turned Clueless Crafer, I had looked at Kahlo's headdress as something unique to her. To know that it is entrenched in a history beyond the painter is something worth knowing. It's a bit sad to see a textile that speaks so vibrantly to a culture appropriated by another for an entirely different purpose.